Can you tell I’ve gotten some sun this week? I’m pretty excited about the little glow I’ve got going, even though I’ve been lathering and layering on the sunscreen. A clothing item I used to take for granted but now wear all the time when outdoors is a hat. Whether it’s a baseball cap or a fancy fedora, I’m all about protecting my face from the sun. This summer I picked up this cute one from Tory Burch – don’t you just love the white grosgrain ribbon? 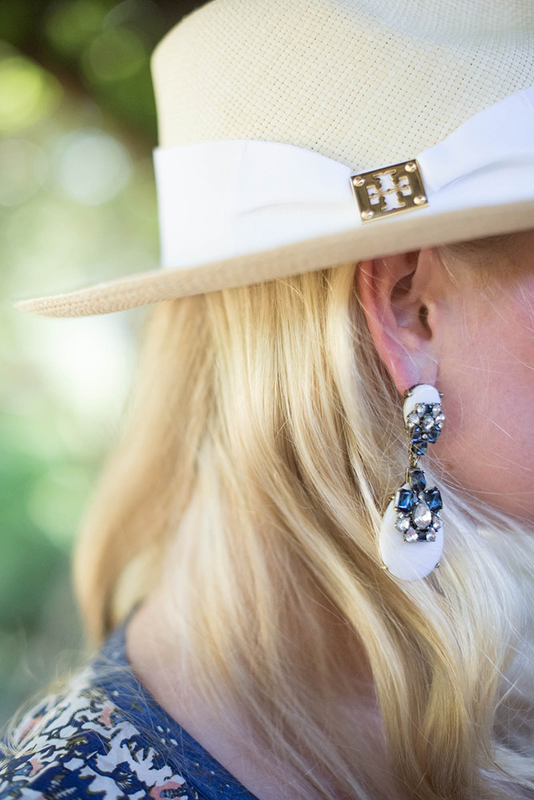 It’s such a chic and light addition to your summer and vacation wardrobe. Did I mention the hat is also available with a navy ribbon or a rust-colored ribbon? So many options! I chose white for versatility and because it goes best with my coloring. Another fedora I’m loving is this crochet embellished one. The beading is gorgeous! Did you know that Tory Burch is having an awesome sale right now? That’s how I got this number at a discount. Don’t you love the print and silhouette of this caftan? So easy. This caftan is a similar print in the same color scheme, but a longer version for those of you who prefer that. Obsessed with this bikini top and bottom (now both are under $100)! I would have already purchased this adorable embroidered dress, however I already have two friends that own it. It really is the cutest. This pair of gold sandals is pretty perfect for weddings, year-round. I’m still hoping this resin minaudiere ends up on my doorstep at some point! If you’re looking for neutral accessories, this scarf is a keeper. Click here to check out the sale! These photos were taken outside of my room at Lake Austin Spa Resort – isn’t the archway beautiful? Stay tuned on Monday where you’ll see all of my photos and a full recap of my stay at the resort! Today is my birthday (the big 2-7) and I’m taking today off to welcome my Dallas friends to Austin for a weekend on the lake – hope you all have a fun weekend! Happy Birthday, have a fun birthday weekend. You do look super relaxed and I do love your hat. I have such a hard time finding one that fits. 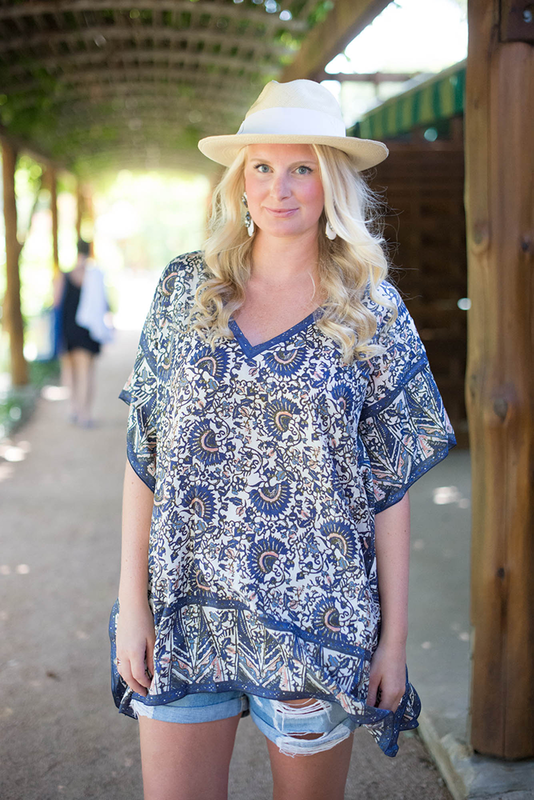 This caftan is gorgeous – I’m loving the relaxed vibe here…you are definitely glowing! You do look radiant:) This look is gorgeous, Merrit. 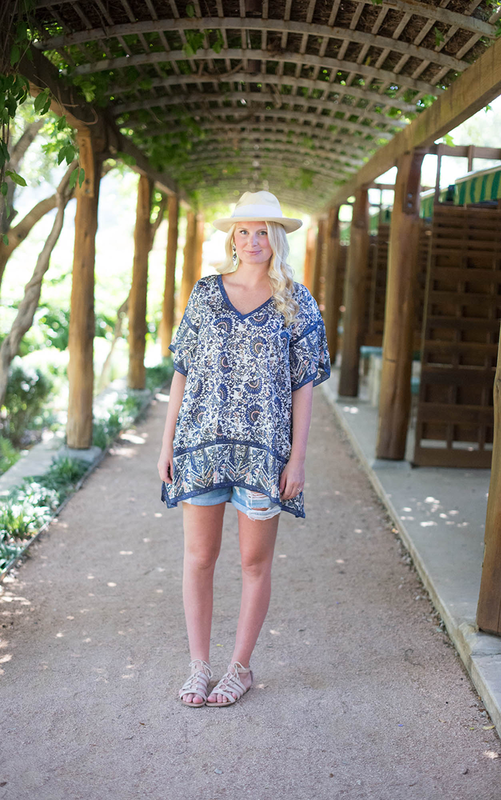 I love the caftan, the distress shorts, and those sandals are perfect. I agree with you about hats and sun protection. 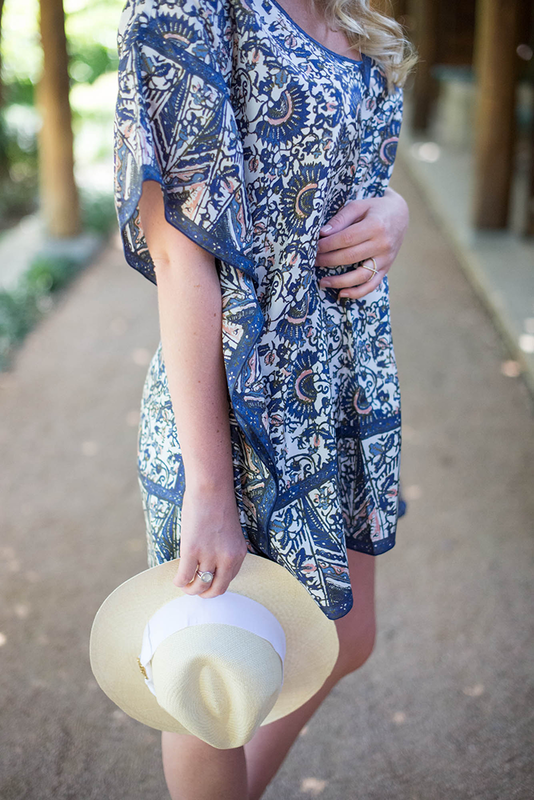 Tunics, hats and cut offs seem to be my go-tos this summer. Happy birthday Merritt!! 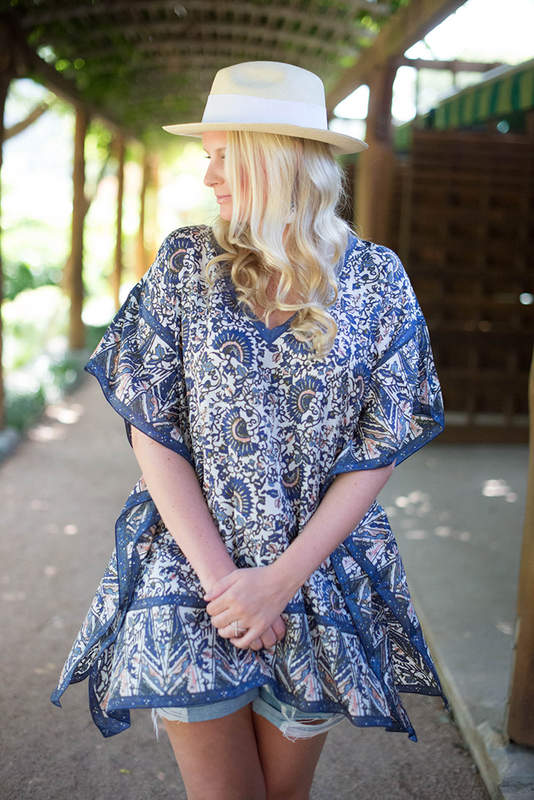 I love anything and everything Tory…that caftan is beautiful! Great look, love those earrings! Love this easy, breezing outfit. Perfect for the weekend:) Have a great one! Happy birthday!! I hope you have a great weekend celebrating. You’re definitely glowing and look so relaxed. I love that caftan! The first thing I noticed was your glow!! Looks great on you =) Love that caftan!!! Happy happy birthday!! Enjoy a whole weekend of celebrations!!! Such a great summer outfit! Hope you have a wonderful weekend! Love this outfit. Perfect for spa! Perfectly laid back! I love a great panama hat. Ever since I bought one, I reach for it more times than not. And those sandals are a refreshing alternative to flip flops. I bought a similar pair from Old Navy and was surprised at how comfortable they are! Loving that hat!! The white accent makes it! I have been coveting these shorts! ah, so cute. Great look! I LOVE your top, Merritt! And the background is gorgeous–Love everything about these outfit photos! This is like the best vacation look and those earrings are great! Love your hat, super cute! Love the caftan with the shorts! This resort looks amazing. Glad you got to relax with your sister.